ASET is governed as a charity by a Board of Trustees, and our Trustees contribute to the running of our organisation by being members of our Executive Committee. Our constitution allows our Executive Committee to have up to fifteen members who may be Trustees or co-opted individuals, and the Committee is also open to our President and the Development Manager in an ‘ex-officio’ capacity. There are currently three Officer Roles within the committee. Sarah is Associate Director of Learning and Teaching (Workplace Learning and Degree Apprenticeships) in the Learning and Teaching Innovation Centre at the University of Hertfordshire. She joined the University of Hertfordshire in 2003, and has worked in a number of roles; development of foundation degrees, employer engagement, supporting access courses in science and developing learning and teaching in the engineering faculty. She is currently responsible for learning, teaching and the development of the Degree Apprenticeship programme across the university. She continues to undertake research in equality, professional identity and early career development. Sarah has been an active member of the ASET Committee since 2002, and was elected as Chair in September 2013. Francesca is a Senior Lecturer in the Lancashire School of Business and Enterprise at UCLan, teaching a range of students from undergraduate to post-graduate. She has a specific commitment to providing them with the best possible employability experience, including research informed teaching. She has recently moved into a new role as Course Leader for the Chartered Manager Degree Apprenticeship, further developing her passion for work-based learning as she works with students already in employment who are seeking to develop their professional skills. As a member of the Institute of Directors, the Chartered Management Institute and a Fellow of the Higher Education Academy Francesca has a wide network of colleagues who provide support and guidance to her students. It is an understatement to say that Francesca is passionate about work-based learning, it has been a key driver in her working life. She knows students who engage with the offer will transform, often beyond their wildest dreams. Francesca has been involved with ASET for more than 6 years, she was co-opted onto the Executive Committee in 2014, elected as a Trustee in September 2015, and elected Vice Chair September 2018. Rebecca has been involved in ASET since 2006, and was elected Treasurer in 2011. As Treasurer she works closely with the Development Manager to effectively manage costs and expenditure as well as researching and effectively investing ASET resources to ensure funds are available to support activities which benefit the membership. She delivers ASET staff development workshops on placement management and working with SMEs and takes an active role in the Membership Working Group. She is now Assistant Head of Student Placement at the University of Leeds, where she is responsible for the development and delivery of opportunities for students; facilitating and leading a wide range of projects and activities and creating an environment in which students are inspired to make the most of their time at Leeds. Her focus is to ensure that Leeds builds ambitiously and creatively upon the range of domestic opportunities already in place – including placements, internships, volunteering, research and leadership to maximise the numbers of students able to benefit. James has recently been appointed Head of Careers and Employability at the University of Kent, where he was previously School Administration Manager for the School of Mathematics, Statistics and Actuarial Science and prior to that Placement Development and Employability Manager working across academic disciplines in supporting both students and staff in placement learning and the sharing of best practice. His active involvement with ASET from 2008, led to being co- opted onto the ASET Executive in September 2013. He became a Trustee a year later and served as Vice Chair from September 2015 -2018. Based at UWTSD’s Swansea Business Campus, Mike is Senior Lecturer in the School of Tourism & Hospitality. As well as teaching business and management modules to both undergraduate and postgraduate students, his responsibilities include being lead for the School’s work placement programme, a mandatory course component of eight separate programmes. 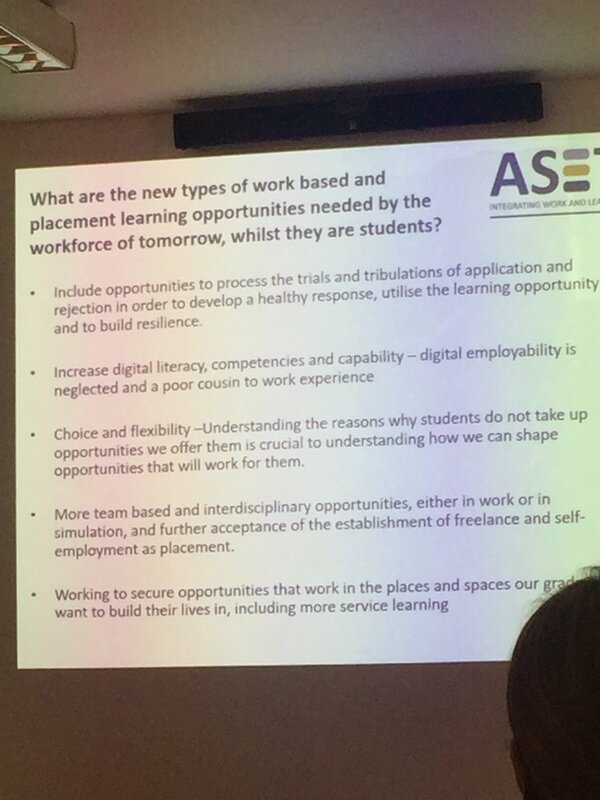 This requires discharging the University’s Placement Programme Co-ordinator duties including student preparation for placements in advance through counselling/support/advice, risk assessments of proposed placements, employer engagement both UK and worldwide, recruitment and retention and dispute resolution where required. It involves maintaining a comprehensive record of individual student placement activity, setting milestones, monitoring progress and taking corrective action as required. This also involves managing the Placement Tutor system, ensuring continuity between colleagues working with programme participants. Mike is a member of the Research Working Group. Mohson is the Professional Liaison Unit (PLU) Manager, in the School of Mathematics, Computer Science & Engineering at City, University of London. He oversees strategy and activities in relation to employability initiatives, both taught content and work-based learning schemes. Mohson’s focus is to embed employability skills development into the curriculum, increase the proportion of students gaining professional experience, and bringing industry into the institution, both for the purpose of educating students and collaborating with academics on research. He has previously been a Work-based Learning Advisor in the Department of Computer Science, has taught in the same department, and has led the unique Professional Pathway Scheme as well as overseeing business development. Mohson was elected at the 2018 AGM and is a member of both the Research and Communications Working Groups. Enterprise at the University of Central Lancashire. Vicki works with a diverse range of students and employers alike. In 2017, the school expanded its placement offer to Postgraduate students and Vicki oversaw the implementation of a placement module for MBA students. Alongside her role, Vicki enjoys research and has just completed a research project into the barriers and motivations to sandwich degree placements with the Lancashire School of Business and Enterprise. Vicki was co-opted to the executive in September 2017 and seeks election at this year’s AGM. Vicki was elected at the 2018 AGM and now leads the Membership Working Group. Vianna is a Placement Development Advisor within the Faculty of Media and Communication at Bournemouth University. Supporting third year students during their placement year in industry, both in the UK and internationally, she serves as an independent coach for students and employers to ensure a quality placement experience. Vianna is involved with coaching and mentoring initiatives on campus such as Placement PALs and the BU Staff Coaching Programme, and is currently undertaking the Doctorate of Education in Creative and Media Practice at the BU Centre of Excellence of Media Practice, focusing on peer coaching within the HE context. Previously she has worked at Queen’s University Belfast and ACCENT International Consortium for Academic Programmes Abroad in London. Vianna was initially co-opted onto the Executive Committee in 2015, became a Trustee in 2016, and is now leading the Communications Working Group. Helyn is an Employability Specialist in Swansea University’s central Employability Academy. As well as working in Placements in HE, Helyn has a wealth of additional Employability Experience having previously worked in recruitment for DfT and in the welfare to work sector for Remploy and DWP. Helyn also has a large amount of Marketing, PR, and communications experience, having previously worked in Public Relations for Swansea University, within Communications in Local Government, and in Marketing and Business Development in an ESF funded ‘Wellbeing through Work’ project. Helyn was a Co-opted member of the Executive Board from January 2018 and was elected at the 2018 AGM. She is currently leading the Staff Development Working Group. Emily is the Employability Manager for the Faculty of Engineering and the Faculty of Mathematics and Physical Sciences at the University of Leeds. In this role she is responsible for the strategic development and management of the Employability service across both faculties. The remit includes, management of organisational links, developing new strategic partnerships with a wide range of industry partners, delivering a clear set of offerings and benefits to key partner companies. Emily has oversight for all co-curricular employability activities including industrial placements, summer internships and timetabled employability modules, and is also involved in shaping institutional employability activity working on projects, which currently includes transitioning to Graduate Prospects and the new NEXUS development at the institution. Having previously gained experience in the private sector, other Russell Group, 1994 Group and University Alliance Mission Groups, she has developed a sound understanding of differing approaches to placement education. Emily is currently leading the Research Working Group, and a member of the Communications Working Group. Colin is Professor of Engineering Education in the School of Engineering at Ulster University, having served as Head of School for eight years. Colin has a particular interest in technologies that impact upon Employability both within the University environment and outside and has led several successful consultancy projects. He has also had a key involvement in Ulster’s strategic response and implementation of the KIS and the HEAR. He continues to bring his understanding of academic management within Universities and how it relates to Employability to ASET and he is a Principal Fellow of the HEA. Colin is also the President Elect of the Engineering Professors’ Council. Colin recently contributed to the review and update of the ASET Good Practice Guide for Health and Safety for Student Placements and is a member of the Research Working Group. ASET is also very pleased to have a President, whose role it is to advise the Trustees of the Charity but who remains an independent voice, to ensure the needs of the membership are being met. Our current President is Dr Geoffrey Copland, CBE. Geoffrey was the Vice-Chancellor and Rector of the University of Westminster from 1996-2007. He held the positions of Chair of the England and Northern Ireland Council and Vice-President of Universities UK 2003-7, Chair of Universities and Colleges Employers Association 2002-6, Chair of Coalition of Modern Universities 1997-2003, Vice Chair of London Higher 2003-7 and Foundation President of World City Universities 2007-8. Now retired, he is Chairman of Thomas Wall Trust, Vice President of Employment Opportunities for People with Disabilities, Chair of the HEFCE Sustainable Development in Higher Education Steering Group, and President of ASET. Geoffrey also holds several other trustee and board positions including International Student House, Trinity Laban Conservatoire of Music and Dance, Helena Kennedy Foundation, Quintin Hogg Trust, and Learning from Experience Trust. Geoffrey is a Fellow of the Institute of Physics and the Royal Society of Arts, Honorary Fellow of Goldsmiths College and Trinity College, London and Honorary Doctor of the University of Westminster. Laura works at Durham University as a Faculty Placement Officer for Social Sciences supporting students prior and on a placement year. Prior to this, Laura worked in a business development role with a particular focus on third sector and preparing students for working and volunteering in the local communities. Laura has joined the Communications Working Group. Kimberley is the Internships Development Manager for the University of Warwick’s central Student Careers & Skills team, with responsibility for central services around work experience. Kimberley leads on the delivery of internship programmes, work-experience-related employer liaison, work experience bursaries and technology-enhanced placement learning tools, and provides internal consultancy on good practice around placements, internships and work experience. She is chair of the University’s Placements Practice Group and part of the Degree Apprenticeships Operations Group. Kimberley has joined the Staff Development Working Group. Patricia is Senior Fellow of HEA and Principal Lecturer in Agri-food Marketing at Harper Adams University where a year-long placement is a compulsory component of all courses. Alongside this, she is Placement Coordinator for agri-food, and business courses, a cross-university role promoting the responsibilities of students, employers and staff in managing placement. Patricia has joined the Research Working Group. Lou is the Development Manager (Engaged & Experiential Learning) at Keele University. She leads the Apprenticeship Team at Keele and is developing placement learning to increase availability and engagement. Lou is a Senior Fellow of the HEA and has worked on a varied portfolio of Higher Education projects encompassing blended and e-learning, Curriculum Innovation, Student Finance and Widening Participation. Lou has joined the Staff Development Working Group. The ASET Executive Committee is supported by a small staff team managed from the ASET Offices in Sheffield. Debbie runs the ASET office and manages the organisation’s operations. She started working for ASET in 2009 having previously worked in retail head office management and in recruitment. Nicola was previously Placement Manager in the Business School at Aston University, and has been a long-time supporter and champion of ASET. As Learning and Development Advisor, Nicola is co-writing and developing staff development workshop material with the ASET trustees and takes a lead on delivery. Janet works alongside Debbie in the office assisting with all aspects of administration, and with a key focus on Membership.